Upon entering the office, we have some brief paperwork for you to fill out. 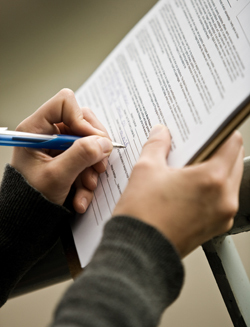 This paperwork provides us with general information about yourself and your condition. Once the paperwork has been completed, you will have a consultation with Dr. DeMalio to discuss your health-related problems, concerns, as well as potential treatment options. In order to determine what your actual problem is, Dr. DeMalio will ask you various questions related to your condition. Next, a number of specialized tests will be performed to determine which body tissues are affected and to what extent. Your specific condition may require x-rays to be taken or other diagnostic tests conducted to either rule out more serious conditions or assist us in developing the most effective treatment plan for you. Once finished with the examination and all appropriate studies, Dr. DeMalio will present a “report of findings” related to your condition. If the doctor feels chiropractic is the appropriate treatment for you, you will generally be provided with treatment during this same visit. This may include spinal adjustments, physical therapy modalities, trigger point therapy, and/or soft tissue therapies. Our office maintains excellent working relationships with many medical professionals in our area. If Dr. DeMalio feels your condition warrants traditional medical treatment rather than or in conjunction with chiropractic care, we will handle your medical referral to the appropriate doctor. Prior to leaving, patients will be given instructions on certain activities or procedures to be conducted at home. This may include anti-inflammatory recommendations, ice or heat application instructions, avoidance of certain activities or positions, home exercises and/or stretches, etc. After your treatment options are discussed, Dr. DeMalio will design an initial treatment program for your specific condition. You will be given convenient appointment options.